This delightful purple brings a feeling of individuality to the Eclipse bar stool, to complement its modern styling. Generously padded across the seat and around the graceful arc of the backrest in high density foam, the Eclipse is long on comfort and encourages you to sit back and relax. The seat is covered in premium purple faux leather which is left smooth so as not to detract from the intriguing shape. 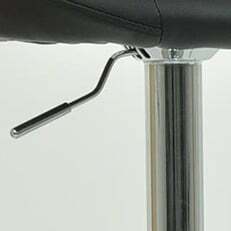 You can use the gas lift mechanism to vary the seat height and you can rotate the seat right round. The lower section is all finished in shining chrome. It includes floor protection fitted below the base and an oval footrest attached to the central column. A striking design in an eye catching colour, the Purple Eclipse is a bar stool that will get your bar area noticed for all the right reasons.